Listen to "Bible (ASV) NT 01: Matthew" on your iOS and Android device. 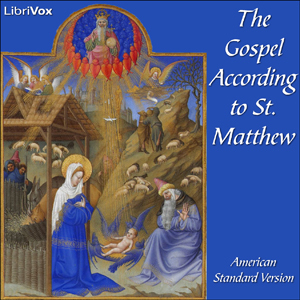 The Gospel of Matthew (Greek: ???? ???????? or ???? ??????? ?, Kata Maththaion or Kata Matthaion; literally, "according to Matthew") is a synoptic gospel in the New Testament, one of four canonical gospels. It narrates an account of the life and ministry of Jesus. It describes his genealogy, his miraculous birth and childhood, his baptism and temptation, his ministry of healing and preaching, and finally his crucifixion and resurrection. The resurrected Jesus commissions his Apostles to "go and make disciples of all nations."